Prewar Elevator, Doorman building with gym access. The studio is adorable: beautiful wood floors, two big windows facing a tree, sky and small street. The apartment faces south so it gets beautiful sun light. Queen size bed for two. Down pillow, down comforter, and fresh clean white sheets. Fully equipped kitchen to cook. Comfortable sofa and reading chair by window. Small cute dinning area for two people. Clean bathroom with a huge bath tub for two. Clean towels, nice soaps and shampoo. Lots of hot water and great water pressure. All my neighbors are very friendly and they will most likely smile at you and say hello. You will feel like you live here. You will get the best customer service. The doorman will do anything for you. I will be in downtown and provide any information you need so you can have the most pleasant stay. I love the doormen here they are so friendly, I love the gym. I use it everyday. I love getting lots of sunlight. I love coming hope and taking a long bathtub. I love reading a book on my comfortable chair near the window. The best thing I like is my queen size bed. It is so comfortable. I love waking up and seeing the trees and sky. Tim is a good person. Room was clean. Towels and toiletries all provided. Laundry detergent is provided. Location is great. Price is fair. 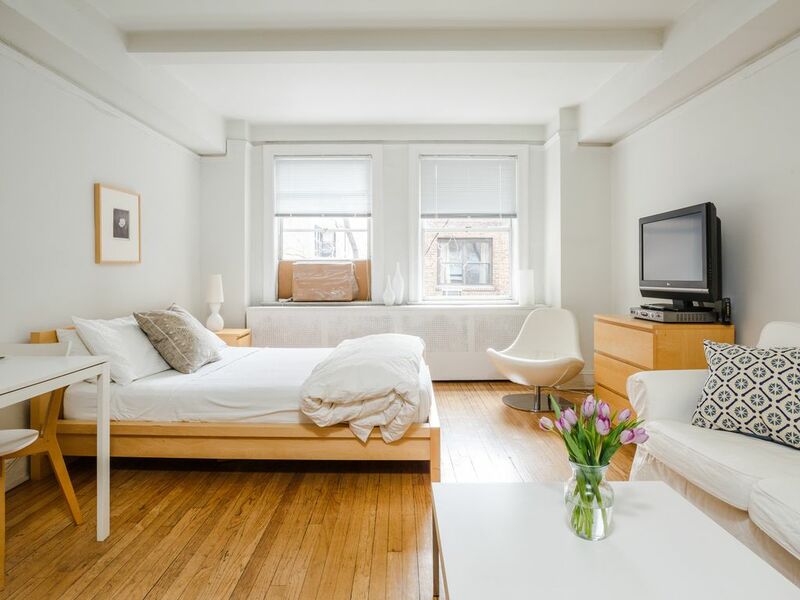 This studio apartment has all you need for an enjoyable and memorable stay in NY. The bed is super comfy and the shower hot. Albeit a small kitchenette it offers you the opportunity to cook your own meals (but why would you when you are in NY!). It’s super close to Grand Central Station, so getting about is super easy. Tim was the ultimate as a short stay host. Friendly and helpful. Tim was a great host. He was responsive, helpful and fun to talk to. The apartment faces the back of the building so it is very quiet. The walk-in closet is great and the laundry room is clean and frequently empty so it is easy to do the wash. The gym had several treadmills, bikes and elliptical machines. The location of the apartment is very convenient to mass transit. We would definitely come back! Thank you, Tim! We stayed here for the New Year's week. The big reason the place is so great is Tim. He contacted me by phone the minute I requested a reservation. He offered suggestions on where to go and what to see. I have never had an owner take such interest in the comfort of his guests as Tim did. The other reasons to stay here are a comfortable bed, central location (we walked everywhere), restaurants and a grocery around the corner, a friendly doorman, and great hot water in the shower (it was cold 20 degrees outside). I would stay here again and recommend it to my friends. Beautiful apartment, small but perfectly formed..! Literally a 5 min walk to Grand Central Terminal so extremely easy to access the subway. Bed very comfortable, shower great. Small kitchenette, we didn’t do any cooking but there seemed to be everything you would need. Tim is extremely helpful, met us to show us the apartment and the area and even took us to Grand Central to help us buy our Metro card for the week, and to Bryant Park to show us the Christmas stalls and the ice rink. Stay here, you won’t regret it. The Midtown location of this apartment was perfect especially being a 5 min walk from Grand Central Terminal where you can catch the subway to anywhere. The apartment is bright and clean and had the basics needed during our stay. We felt safe and secure in a building with a doorman. Timothy is a great host, willing to help you in any way he can. We especially appreciated the tour of the neighborhood when we first arrived! Thank you Timothy for allowing us to use your apartment for our 30th anniversary adventure to the big Apple...we had an amazing time! The apartment is located to all the winter tourist attractions that you see in the listing and much more.